Once we get a hold of electric scooters, everyone starts carving speed. Well… Why not? And what fun are electric scooters if you have to go slow. All the advancements in technology and the powerful motors have provided us with vehicles with unimaginable speeds. But these advancements and high speeds are not limited to only cars and motorbikes, now even the electric scooters with high speeds are available. So, yes you can be happy because you have so many options out there when it comes to fast electric scooters. But, who wants to go from store to store asking for the fastest electric scooter. Exactly, NO ONE! Well, don’t you worry because we have got you covered? 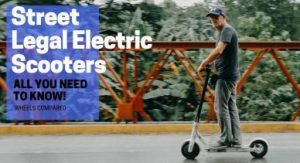 We have sorted for you the list of the fastest electric scooters out there in the market. So, what you gotta do is just select one from our list and have a blast with it right away. No hard work… Right. And that’s not it, sometimes while focusing on one feature, you overlook the other features, but we won’t let you do that. We have carefully reviewed all the electric scooters in our list and have selected only those that are not only super-fast but also the best ones in each and every aspect. Not only this, but we have also included the high-speed electric scooters with not so high prices, so you don’t have to go over your budget. 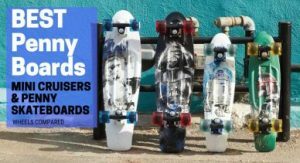 To further make your decision easier, we have a buyer’s guide and a comparison table at the end so you will know how to select the right electric scooter and make every penny count. Let’s not make you wait anymore and get started with the Top 3 Fastest Electric Scooters and then we’ll carry on by reviewing each model one-by-one. Q: Can I ride my electric scooter in the rain? Q: Will my weight affect the scooter’s speed? Q: Is there an electric scooter with a phone mount and a seat? Q: Can I charge my electric scooter for 24 hours? The MAXX electric scooter is the electric scooters with the highest speed in our list. It has the top speed of 55 mph… INSANE Right! It’s a powerful motor, and off-road pneumatic tires make it all the more suitable for cruising at high speed. The looks of it along with the flashing LED lights really make this beast stand out. The MAXX electric scooter is a very fast electric scooter with 55mph top speed. At such a high speed you will really feel as if you are flying in the air. 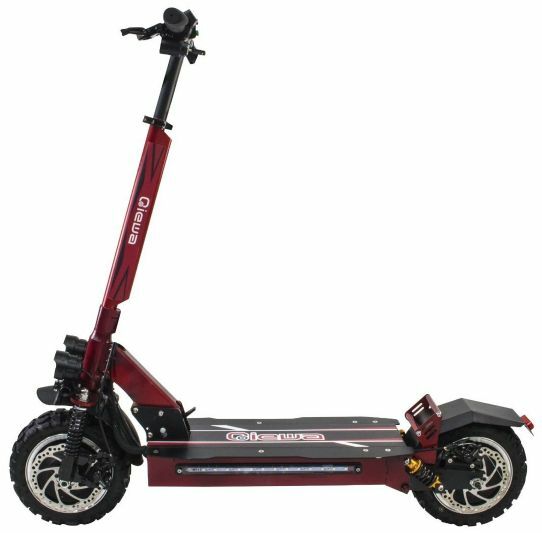 This top speed is due to the powerful motors of 1600 W that give this scooter a total power of 3200 W. The dual motors make it not only suitable to cruise around at higher speeds but also for riding on terrains or uneven paths. This is the best thing about this beast that it will take you EVERYWHERE and that too at super high speed. It’s big 11-inch pneumatic tires will go anywhere you take them. The tires are specifically off-road pneumatic tires so that you don’t get limited to the road only. You can ride on terrains, pavements, dirt tracks or where ever you like, with these powerful and fat off-road tires. The battery is a 60V 26Ah lithium battery which gets charged fully in about 5 to 7 hours which is great as you don’t have to wait longer to ride your scooter. Disc brakes and a suspension system make the braking system really good because of course, at such a high speed you need exceptional brakes. It does have not only the front and rear oil brakes but also the electronic brakes. This 45 kg electric scooter looks very cool and sturdy. It looks huge and has LED lights in its deck too that will light you up while standing on it. You will have a multi-function LED headlight, a LED highlight, and dual rear brake explosion-flashing light. Such a lit up scooter is sure to turn heads around. The only con I could found was that for this one you would have to extend your budget a bit. Well, you can’t get so much without paying for it. So, I would say the price is justified as you are getting almost everything and it is worth every cent so why not. If you want a powerful electric scooter that would go anywhere and that too at a very high speed. And you want it to look attractive too then go no further because the MAXX electric scooter is surely the one. So, have fun flying off this beast. The Qiewa Q power electric scooter is a great combination of high speed, good features, and decent price range. So, for those who don’t want to extend their budget much but still want really high speed then this it. This electric scooter by Qiewa is no less as it has an AMAZING top speed of 50 mph. This is almost equivalent to that of the MAXX electric scooter, and the motor is also powerful. The Qiewa Q Power electric scooter has dual motors of 1200 W each, so they altogether give a power of 2400 W which is pretty awesome. The wheels are 11 inches and air filled and are great for any off-road conditions. So, like the MAXX you can take this one off the road too. The pneumatic tires will provide you with great shock absorption and will make your ride smooth. What I personally like about this electric scooter is that it has a range of 50 miles so you can enjoy cruising at high speed to your heart’s fullest. Coming to the braking system which is really important for speedy electric scooters; this one has a double hydraulic braking system. It works great, so you won’t have any problem making a stop. This one also looks good and has brake lights. It weighs 35 kg which is a very ideal kinda weight and it is also foldable. What can one ask for in such a decent price range! For this one, I could much to the con’s section because it’s price tag is pretty reasonable. Hence, I did not feel like complaining. Still, just for the formality I would say be careful with the brakes at high speed. The brakes would stop you instantly so try to use them a little before you want to stop so you can make a stop steadily. And this applies for almost every electric scooter that has an efficient braking system. All in all, it is a complete package and worth your money. It is priced reasonably, has great top speed and range is just exceptional. The Qiewa can be folded, and you can take it off the road too so this one is one of my favorites. It has definitely got quite much so, do give this one a try. NanRobot always comes up with some great stuff, and the NanRobot D4+ is no exception. So, let’s see what we have in store with the D4+. The NanRobot D4+ will take you at a top speed of 40 mph, and like the other electric scooters, the D4+ is powered by two motors. Each one has a power of 1000 W which gives you a total of 2000 W. The battery is the lithium battery which will take around 8 to 10 hours to charge fully. You can ride this electric scooter for about 45 miles with a single charge which is pretty decent. This goes without saying that the range entirely depends on your weight and where you are riding your bike. The tires are, and this electric scooter is equipped with six shock absorbers which will surely make a bumpy ride really smooth. The braking system is quite good because even at top speed you can make a steady and stable stop which is quite rare in electric scooters. What is more good about this scooter is that it has a detachable seat so one can ride it while sitting or standing. A seat is a great option for people who are a little afraid of high speed, with this they can get more comfortable even at top speed. The scooter has a sleek and simple black look that makes it look cool. This one won’t go up steep hills, but it might take you on normal terrain. But that depends on the rider’s weight too. Other than this I would recommend you to tighten the brakes before riding it. If you don’t feel confident enough or you simply don’t feel like going to about 50 miles speed, then the NanRobot electric scooters are a great option. They are reasonable and have great features to support the top speed of 40 mph. So, this one is also by NanRobot and is pretty much as good as the NanRobot D4+ with only a few differences. But as the top speeds are the same so you can choose whichever you prefer out of the two. The D4+ and D5+ have most of the same features as both have the same top speed of 40 mph. The wheels and motor are also the same so, I’ll get straight to what is different between the two. The D5+ has a greater range of 50 miles which is really good, and you can cruise around the town for quite long. It weighs the same as the D4+ and is also foldable. In addition, it also has a detachable seat so you won’t get tired while cruising and have fun without any fatigue. When it comes to the price, the D5+ is a few dollars more than the D4+ so, you can save a few dollars with D4+, but both are great scooters. I think this one has more good looks as compared to the D4+ so, if you are conscious about the looks, then you might consider this one. It also has front and rear LED lights and a LED display too, so it is quite suitable and safe for riding in the dark too. Moreover, the lithium battery of D5+ requires only 3 hours to charge fully so you can enjoy riding it sooner. I don’t see why it is priced a bit more than the D4+; it might be because of the reported range. But, practically you will get a range less than 50 miles. Of course, it might also get affected by the weight of the rider. Another thing is that it might need more than 3 hours to be ready for the next use. 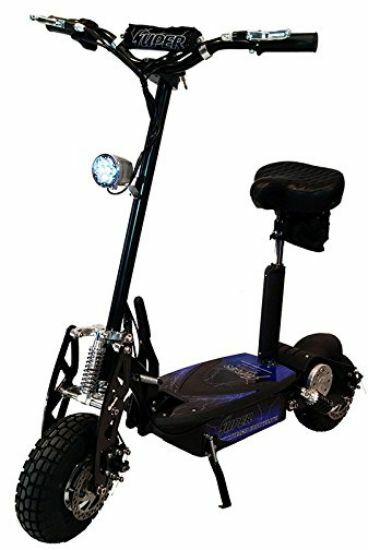 If you want an electric scooter to ride at night too then, you can get the D5+ as it has LED lights to help you at night. Otherwise, you can go for the D4+ and save a few dollars too. But both of the NanRobot electric scooters are worth your money, so at the end of the day it all comes down to your decision. Just as the name says, Qiewa Qmini electric scooter is small yet a powerful electric scooter with a great top speed of 37 mph. It has a compact design yet it is no less than the heavy, powerful and high-speed scooters. 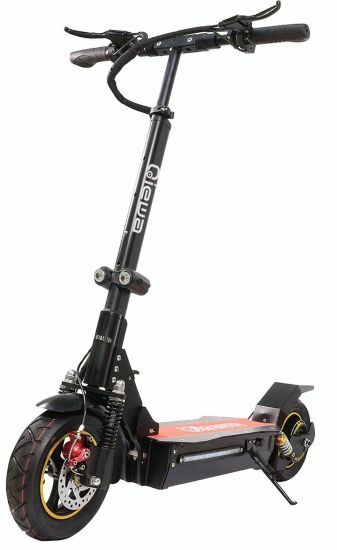 The Qiewa Qmini electric scooter is definitely for those who are looking for a fast, portable electric scooter that is easy to carry around even on trips. It has a top speed of 37 mph which is just INSANE for a scooter of this size and weight. This electric scooter is powered by a 500 W brushless motor, and the good thing is that you can always replace it with a motor of more power. The range is also very good, and you will be able to have fun riding it for 35 to 37 miles with a single charge. The tires are 8-inch solid rubber tires so you won’t have to worry about any flat tires or about the air pressure and things like that. The Qiewa Qmini weighs only 22 kg, can’t believe that? We also could not. But this is what makes it super ideal for taking with you on trips or when you go out camping. You can just put it in the back of your car and carry it around easily and even on hilly areas or rough roads you won’t have to deal with flats. And this is not it; you can even fold it, so it’s all that you need on your trip. You can cruise around at top speeds with this one wherever you go vacationing. 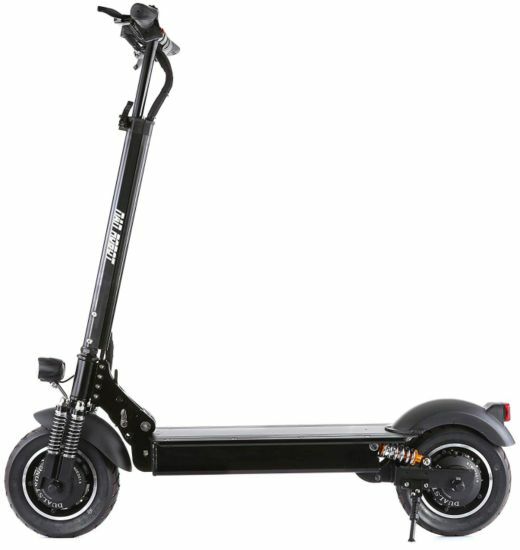 As it is a lightweight scooter so its speed will greatly be affected by your weight and the road conditions. So, don’t get surprised if you are not getting the stated top speed. Still, it performs pretty well. It is a complete package as far as using it on trips or camping is concerned. It is lightweight, foldable, portable, has rubber tires that won’t deflate and also has great top speed. So, for anyone looking for a portable yet high-speed electric scooter, I would recommend this one. Qiewa has built this one with great precision, and that shows in this Qiewa Q1 Hummer electric scooter. It is very durable and will last quite long so you won’t have to get a new one soon. The Qiewa Q1 Hummer is specifically for those who don’t want to empty out their pockets, again and again, buy buying different electric scooters. This is built in a sturdy way so it will take quite a beating and will last much longer than the other scooters. Its build-up is what actually makes it shine, and you will agree with this just by looking at it. So, the top speed it gives is 35 mph which is very good at such a decent price range. 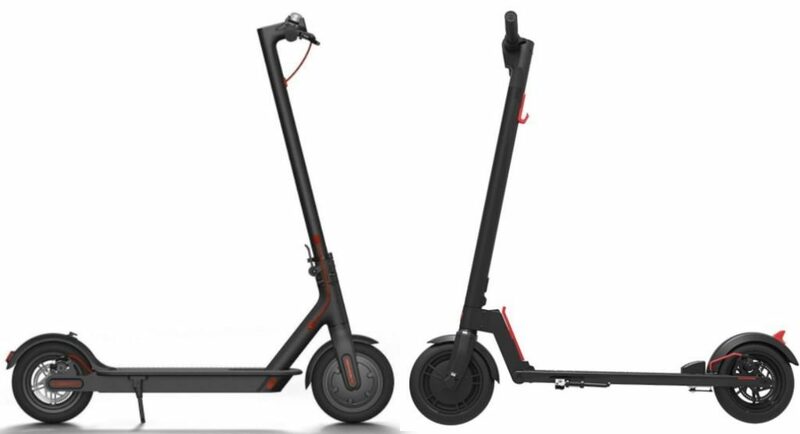 It is powered by 800 W dual motor, and the battery is the lithium battery which is found in most of the scooters. The tires are 10-inch pneumatic tires, and they are great in absorbing all the bumps in the road. What will put you in awe about this scooter is that it has a range of 62 miles which is pretty rare to find. So, if you want an electric scooter for commuting to your office or college or any other place, then this one is a good option. For the stopping, you have double disc brakes which will really help you with the high speed. The first thing is that the wheels are pretty much ideal to go on terrains, but the motor is not that powerful to take you up hills. I expected it to perform well on terrains too at this price, but that was not the case. And some of you might complain of it being a bit heavy. But if you want this much of a range, then you can’t complain much. For commuting over long distances with good speed, the Qiewa Q1 Hummer electric scooter is pretty great. In addition, it is sturdy and robust so it will handle all the rough and tough pretty well. Mercane is well known for its sleek and stylish electric scooters. The wheels they use are also very suitable for cruising around. All in all, they provide quality products with quality performance. So, with this one, you can get 28 mph top speed which is good at this price. The motor that powers this scooter is a hub motor of 1000 W power and it is enough to take you up medium terrains and glide on the roads. The battery used is the traditional lithium-ion battery, and it will take you on the road for 19 miles with a single charging. 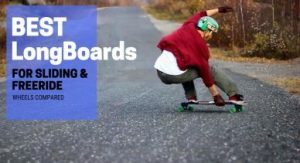 What I personally like about this board are its looks and lightweight. It looks sleek, simple and smart and is very light so this makes it easy to carry around. By the looks of it, I would say that it is suitable for a kid above 12 or 14 too. And if you have a teenager at your home and he or she wants a speedy electric scooter, then this is it. It is not only affordable but also ideal for teenagers and looks cool too. The Mercane WideWheel electric scooter has 3.9 inches wide wheels that are solid urethane wheels with rubber as a top layer. Because of these wheels, you won’t be dealing with any flat tires. So, you can take it on stony paths too as you don’t have to worry about checking the tire pressure again and again. Moreover, the wheels also increase the stability of this scooter. So, the ride will be pretty easy to handle even on a bumpy road. 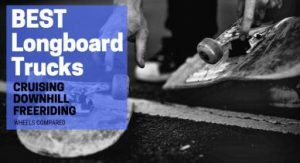 Well, the board does not display your speed so that is an issue as you can’t keep track of that. Another thing is that the range is only 19 miles which are not impressive at all. So, it is not suitable for commuting rather it will be fine just to have fun cruising on it to nearby places. All in all, it has good looks and wide wheels that improve its stability. But, it might be suitable only for teenagers as they would mostly cruise around with it and not use it for commuting over long distances. This electric scooter has got some serious looks and you might for a second feel like riding a mini or older version of a Harley Davidson bike. Let’s take a look at what it has got in it for you. Just by looking at it you can tell that this bike is not an ordinary bike. If you really wanna impress your neighbors with your latest purchase, then this beast is just the right one. The top speed it gives is 27mph, and it uses a hub motor of 1500 W which is powerful enough to take this scooter off the road. It uses a 60V 10Ah lithium-ion battery which will need 1 to 2 hours to charge fully. But I would recommend you to get it charged for 3 hours. The wheels are where the rift UH-ES295 electric scooter shines. The wheels are 51 inches fat tires that are just too good. They will take you literally ANYWHERE. These are perfect for off-road cruising and are durable too. The range is 25 miles which I thought was not good enough for such a good looking electric scooter. But, then I found out that you can add an additional battery pack to this scooter and the range will boost up to 60 to 75 miles. This, of course, depends on certain factors like your weight, where you are riding your scooter and things like that. 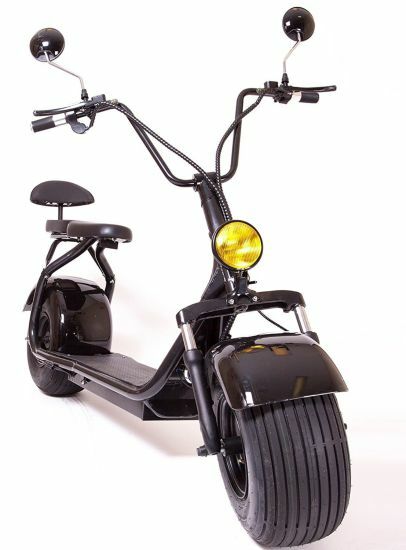 The brakes used in this scooter are the hydraulic disc brakes that work efficiently. As much as it looks appealing, it requires quite much maintenance too and some assembling too before you can take it on the road. Moreover, some of the features like the range are not that impressive. It might be because there is more emphasis on the looks. If you crave for a good looking electric scooter with good speed, then this is the best option so far, and it will surely get too much attention. But, if you don’t care much about the looks and just want great features, then there are many good scooters for the same price but better features. All in all, it is a good exchange for your money. 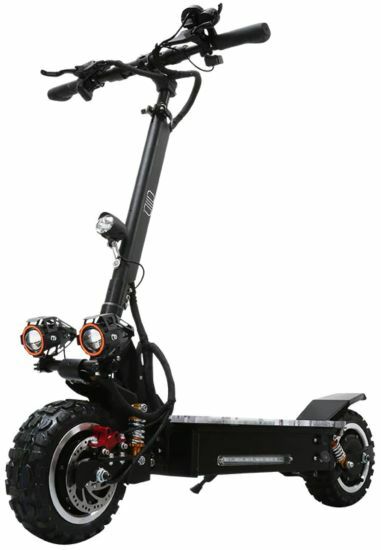 The Super Turbo Elite electric scooter gives great value for your money with its powerful motor and 51-inch fat tires that make it suitable for off-road cruising. This one won’t be heavy on your pocket. The Super Turbo Elite electric scooter takes you at a top speed of 26mph. 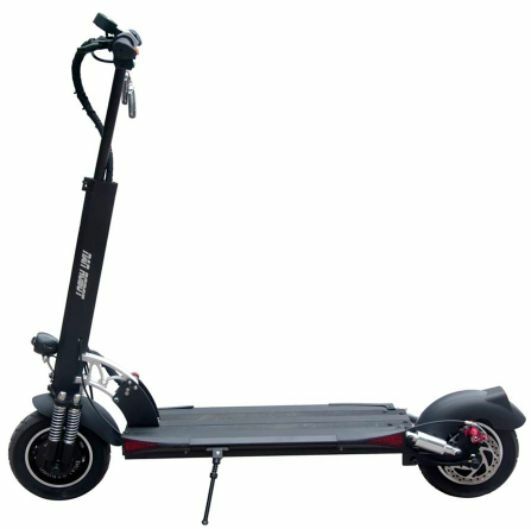 It is powered by a 1000 W hub motor which is great for a scooter for this speed and price. The motor is quite powerful so it will take you up inclines. The wheels really stand out in this scooter as they are 51 inches fat tires. Yes, you heard it right 51 inches and for this less amount of money. The wheels are too good for off-road cruising and will take you through grasslands, bumpy roads, and cracks smoothly. The battery is a 12V 12Ah deep cell battery which is quite reliable and enables you to travel 18 miles with a single charge. Acceleration and braking is also good. If we talk about its looks; it looks quite cool and sturdy, and it also has a seat so you can sit if you feel tired or just don’t feel like standing. Coming to its performance, the top speed says 26 mph but practically it gave 30mph top speed which we didn’t expect at this price. So, it was definitely a treat. But of course, this goes without saying that the speed will be affected by your weight. The brake pads of this scooter might need a replacement after frequent use, so that’s a thing to consider. Another thing is that the range is very less so it might put you off. Honestly, I was a bit concerned about the range, but with such a powerful motor, beastly tires and a decent price range, you have to give it a try. Hence, if you don’t have to ride for long and the range is not a big deal for you, then you can take this into consideration. Swagtron always comes up with affordable options when it comes to electric scooters. 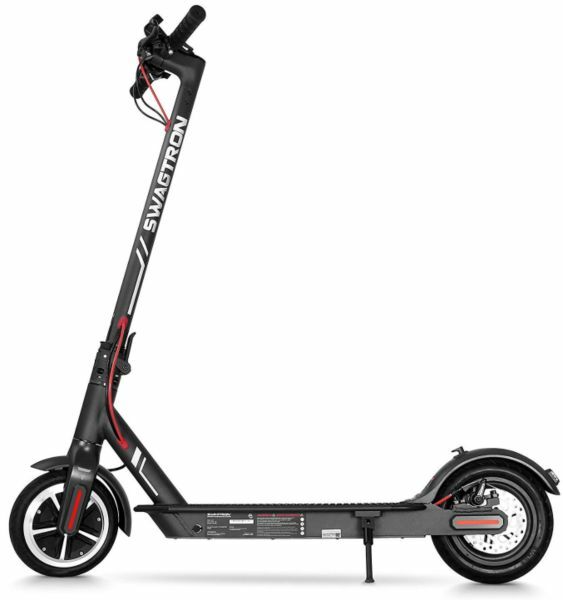 The Swagtron Swagger 5 Elite is also such an electric scooter that not only costs less but delivers more and is EXTREMELY portable. 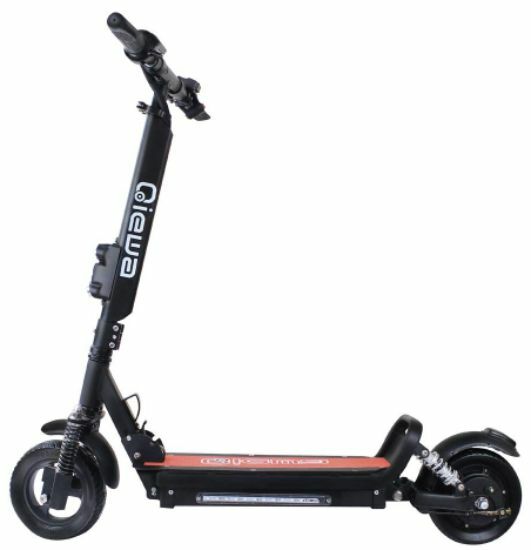 The Swagtron Swagger 5 Elite electric scooter is a good option for people who have a very limited budget but want to enjoy a good speed. It gives a top speed of 18mph and is powered by a 250 W electric hub motor that will get you up inclines of about 20 degrees or a bit more. The battery needs just 3.5 hours to charge fully, but if you want better performance, then I’ll recommend getting it charged for more than 3.5 hours. The range which you will get with this one is 18 miles with a single charge. It also has a LED display and a phone mount. This one stands out when it comes to portability and lightness. It weighs just 12.5 kg which is actually INSANE, making it the lightest electric scooter on our list. It is also very portable as it can be folded so, put it on the back of your car or under the subway seat and commute with it easily. It also looks quite cool as it has a simple and sleek design. The wheels are 8.5 inches and will take you up inclines that are around 20 degrees steep. The braking system is also good as the disc brakes have been used and you will make a smooth stop. For a pro, this much speed might not be enough, so I’ll suggest buying this one for your teens or kids as this speed is ideal for them. Moreover, the tires are cushioned and tend to cause a problem when the inner tubing gets damaged. But, the good thing is that now Swagtron has replaced these tires with solid rubber tires which work fine. I personally believe that it is more ideal for kids and teens rather than adults. But if you are an adult and don’t wanna go above this high speed, then you can go for it. The portability, lightweight, and low price are what makes it very ideal for taking with you on trips or anywhere you want. We will be talking about the speed first because right now we are specifically concerned with speed. So, if you are a pro in riding an electric scooter, then a speed of 40mph or more is ideal for you. In this case, the MAXX electric scooter, Qiewa Q power electric scooter and NanRobot’s electric scooters will be best for you. On the other hand, if you don’t wanna go that much fast but still want good speed, then electric scooters with speed of 35mph to 40mph will be good to go, like the Qiewa Q mini or the Qiewa Q1 Hummer electric scooter. 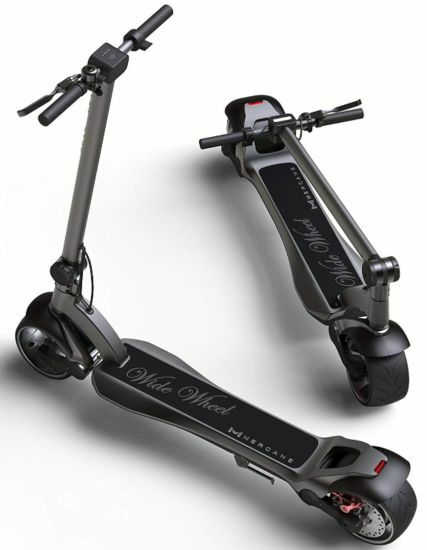 In addition, if you are a teenager and you want a speedy electric scooter, then all the scooters below 35mph will be good for you, and the Mercane WideWheel electric scooter would be great for teens. But, if you are sure that you can handle speeds above 35mph too, then you should definitely give it a try because you will have INSANE fun at such high speeds. In addition to this, I would like to remind you of a very important thing that the speed of your scooter will get affected by your weight, battery and where you will be riding your scooter. So, don’t get surprised if your scooter starts slowing down on some terrain or at low battery. When it comes to the range, it totally depends on what you prefer or what you personally need. If you want to use your high-speed electric scooter for commuting to your college or your office that is a bit far from your home, then you can get an electric scooter with a high range. The NanRobot electric scooters and Qiewa, electric scooters ones, have very high ranges specifically the Qiewa Q1 Hummer which has 62 miles range. But, if you don’t want that much range, then you can go for other options on our list. Here again, I would mention that range is affected by your weight and where you will be riding your electric scooter. If you weigh more or you are riding on terrain or muddy tracks, then the range will definitely get reduced. The rider’s weight very much affects the performance of the electric scooter. Every scooter has its own capacity of carrying a certain amount of weight. If you exceed its limit, then it is sure to affect the performance. The more you weigh, the less the range gets. If your weight is normal, then the scooter will come up to its stated range or sometimes more than that. Other than this, your weight can also affect the speed of your electric scooter. Increased weight will reduce the speed of the scooter, especially on terrains whereas with a normal weight the scooter maintains its speed. The wheels in your list might include pneumatic wheels, solid rubber wheels, wide tires and fat ones too. So there is quite much of variety when it comes to wheels. The different wheels are effective in different road conditions. For normal conditions and more shock absorption you can use pneumatic tires, and if you don’t want to deal with flat tires, then you can consider solid rubber tire. But for off-road conditions big tires of large diameter or width can be selected. The braking system of your electric scooter needs to be very good because you will be riding at really high speeds. You should read reviews too for the braking system of each scooter, so your money does not go to waste. But, all the scooters we have listed here have a great braking system. Remember, most brakes stop you instantly so, to avoid falling off try to press the brakes slowly and a little before you want to make a stop so there will be a smooth stopping. How much you want to pay for your electric scooter depends on your budget. If you want to get a very great bike and don’t have to worry about the budget, then you can go for MAXX, NanRobot or some of the Qiewa electric scooters but if you can’t expand your budget, then you can also look for electric scooters under $1000 in our list. So it all comes down to you. A: No, it is best not to ride your electric scooter in the rain. Some electric scooters might be water-resistant, but they are not completely water-proof. That’s why it’s better not to take any risks and avoid getting them into the water. You should also check what your company says from which you are buying your electric scooter from. A: If your weight exceeds the weight carrying capacity of the scooter, then it will surely reduce the speed of your electric scooter. If you are slightly heavy, then it can also affect the speed of the scooter. 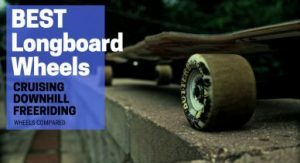 Another thing to add whether you are riding a cycle or a scooter your weights gonna matter, so head-over to Active.com to learn more about the affect of weight on speed. A: Yes, there are scooters available with phone mounts and seats too. Particularly in our list, the Swagtron Swagger 5 Elite has a phone mount, and the Super Turbo Elite electric scooter and some other ones have a seat attached to them. A: Every electric scooter has a charging time given by the company so that time should be followed. If the company has recommended charging the battery for 24 hours only then you can do so. Still, you should confirm it from the seller you are buying your electric scooter from. Check this post by Fortune.com on charging electric scooters. You will find all sorts of electric scooters with high speed in our list so you can find one easily that best suits your conditions or your preference. You can further take help from the buyer’s guide to make the right decision, and with this, we have ensured that your money does not get wasted. We hope this will be helpful to you. In case you still have any queries, feel free to ask in the comments section below. If you want to give any suggestions, then do the same. As the final verdict, I would say that it is all about having the fun you deserve. So make every penny count by having fun on your electric scooter at high speed. And in the comments section, do let us know which scooter you found appropriate for yourself and how was your experience with it.